When you think of Hot Toys, you think of expensive, gorgeous and ridiculously detailed figures - but they don't just do those. 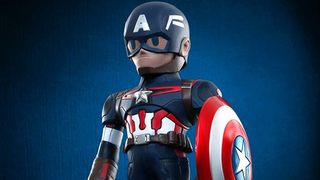 They've announced a new line of smaller-scaled vinyl toys, kicking off with Age of Ultron figures that reimagine Cap, Tony and Ultron in the most adorable manner. D'aww, poor Ultron! Hot Toys have yet to reveal much about the figures outside of their existence and the height - around 14cm for the 'standard' figures, with the plus-sized Hulkbuster coming in at roughly 22cm - no details on price or when they'll be available. For now, just gaze at the pretty pictures, plenty of which you can see over on Hot Toys' website.